ChargeDesk is the ultimate billing toolkit for your business. If you're using Stripe, PayPal, Braintree, Recurly, Zuora, Chargify, WooCommerce, NMI or Payments MB to collect payments, then you should be using ChargeDesk to improve your billing and support workflow. You'll work faster and your customers will be happier with ChargeDesk. If you're just starting out and are not sure how to collect payments, ChargeDesk can help there as well. View the Gateway Feature Matrix for a breakdown of which features are support for your gateway. We've spent countless hours refining the ChargeDesk Customer Support App to make it incredibly easy for you to manage your customers where you're already interacting with them. You can see customer payment histories, refund charges, manage subscriptons and much more all inside your helpdesk, your internal admin pages and even see your customers tagged on any webpage you visit using our Chrome extension. With our mobile apps you can manage your customers on the go as well. While ChargeDesk works with existing customer data in your gateway, you can also use ChargeDesk to collect payments and card details from new customers. ChargeDesk is quite unique in that unlike most billing management providers, we use your payment gateway as our primary source of record rather than our internal systems. This means that you retain complete control over your customer payment data. If you ever choose to leave ChargeDesk you'll be able to continue charging your customers and any subscriptions you create through ChargeDesk will continue to run. Every payment is the start of a new relationship between the customer and your business. The best companies use this as an opportunity to make each customer feel appreciated. ChargeDesk can help generate beautiful receipts, invoices and billing pages for your payments. 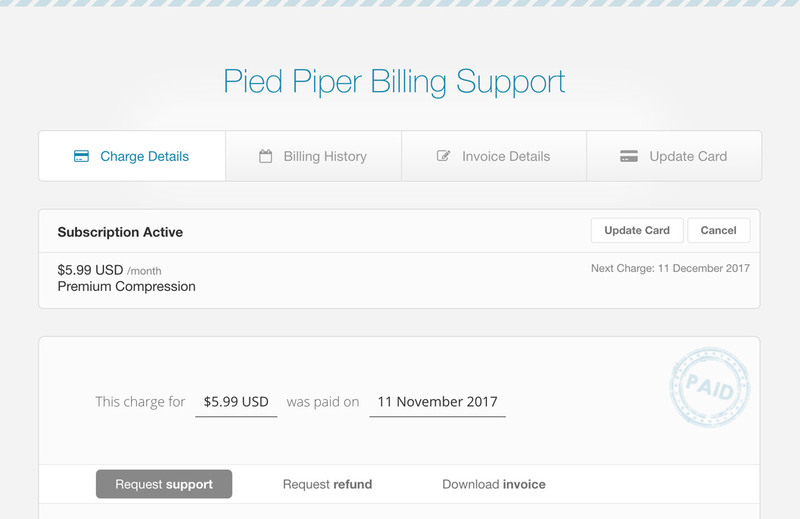 The billing pages keep your customers informed about the status of their charges, subscriptions and billing history. Your customers can use these pages to do things like request billing support, cancel a subscription, update their invoices or their card on file for your company. By giving your customer access to all this information, not only will they feel better informed, but your support load will decrease as customers will be able to perform many of the most common billing support requests by themselves. As a business grows it can be hard to understand changes to your revenue. ChargeDesk's reporting allows you to track changes to your revenue. Our overview charts give you a high level picture of your payments across all your gateways, while our agent activity logs and subscription cancelation reports allow you to understand where your refunds and cancelations are coming from. Our system also allows you to generate tax reports at the for your accountant at the end of your financial year. ChargeDesk is trusted by thousands of companies to manage many millions of customers. Companies using ChargeDesk include well known brands such as Medium.com, Procter & Gamble, US Mobile, 500px & The Black Tux. See what all the fuss is about and try ChargeDesk for your company today.